PAyapa at MAsaganang PamayaNAn or PAMANA is the national government’s convergence program that extends development interventions to isolated, hard-to-reach and conflict-affected communities, ensuring that they are not left behind. A complementary track to peace negotiations, the program is anchored on the Aquino administration’s strategy of winning the peace by forging strategic partnerships with national agencies in promoting convergent delivery of goods and services, and addressing regional development challenges in conflict-affected and vulnerable areas (CAAs/CVAs). The design and delivery of PAMANA is conflict-sensitive and peace-promoting (CSPP) to avoid the recurrence of any source of conflict. What are the strategic pillars of PAMANA? PAMANA aims to extend development interventions to isolated, hard-to-reach, conflict-affected communities to ensure that they are not left behind. With a number of national line agencies as implementing partners, PAMANA remains as the government’s flagship program for conflict-vulnerable and –affected areas in the country—covering all existing peace tables and agreements. IMPROVE GOVERNANCE through partnerships with national and local institutions, building capacities or governance, and enhancement of transparenct and accountability mechanisms. REDUCE POVERTY and vulnerability in conlict-affected areas through sustainable rural development, community infrastructure and focused delivery of social services. EMPOWER COMMUNITIES and strengthen their capacity to address issues of conflict and peace through activities that promote social cohesion. Monitoring and evaluation is done with partners from civil society organizations (CSOs). Project billboards and web-posting of implementation status ensure public information, and serve as feedback mechanisms for the media and the public as well. 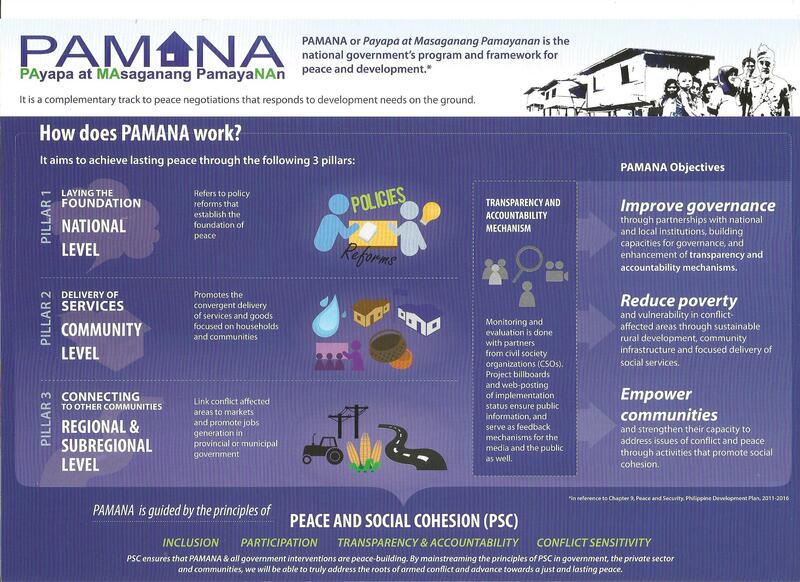 PSC Ensures that PAMANA and all government interventions are peace-building. By mainstreaming the principles of PSC in government, the private sector and communities, we will be able to truly address the roots of armed conflict and advance towards a just and lasting peace. For the Cordillera Administrative Region (CAR), PAMANA will largely be the implementation of the GPH-CBA-CPLA Memorandum of Agreement (“Closure Agreement”) signed on July 4, 2011, with the following components: 1) economic reintegration and livelihood of CPLA members; 2) development of communities with CBA-CPLA presence; 3) transformation of the CBA-CPLA into a legal entity for socio-economic development; 4) inter-municipal and inter-barangay economic development for selected areas in the Cordillera; and 5) documentation of the CBA-CPLA struggle. The Closure Agreement was designed and envisioned to be implemented guided by PAMANA as the government’s framework for peace and development in conflict-affected areas. At the same time, PAMANA as a program is seen to fund some of the concrete projects particularly the community development infrastructures and livelihood projects identified in the Agreement. The PAMANA beneficiary areas in CAR include 57 barangays in 23 municipalities in the 6 provinces that were identified in the Closure Agreement. The Bicol Peninsula can be found in the south-eastern tip of Luzon. The Region’s history of participation in progressive and militant struggles, geographical terrain, poverty and share of social injustices has made it a fertile ground for armed conflict to continue and flourish. The lack of economic and employment opportunities aggravated by cases of corruption, non-transparency, lack of sense of accountability and fraudulent elections marred by massive vote buying heightens the level of frustration and sense of helplessness of some community members that they opt to align with non-state armed groups instead. Contiguous to the Bicol Region is the Province of Quezon which shares similar landscape of social injustice and inequity issues and history of conflict. Despite the significant decline of conflict in the area and improved human development index, a number of municipalities in Bondoc Peninsula, Quezon remains to be surrounded by conflict given its proximity to similarly conflict-affected areas of Bicol Region and remaining land-related issues. This PAMANA Bicol-Quezon corridor further extends westward to include the Mindoro Island, and covering Mindoro Oriental. The impending displacement of Indigenous People (IP) communities arising from mining and other resource extraction activities, ancestral domain issues and human rights violations (HRVs) are among the major issues that expose communities to vulnerabilities and threats to human and ecological security due to the prolonged armed conflict in the area. In support of the peace process closure track with the Rebolusyonaryong Partido ng Manggagawa ng Pilipinas–Revolutionary Proletarian Army–Alex Boncayao Brigade (RPMP-RPA-ABB) Tabara-Paduano Group (TPG), the Philippine Government has committed to provide various efforts under PAMANA to be implemented in different barangays in the 37 municipalities of Negros and Panay Island Provinces. These projects cover communities which the TPG believes should be recipients of peace dividends while the track for a political negotiated settlement is ongoing. Support for these projects serve as peace dividends that will benefit not only the TPG members but also communities affected by armed conflict. It will facilitate processes for the eventual mainstreaming of TPG members in said communities where they are likely to be settled following the signing of the closure agreement. The Davao-ComVal-Caraga zone is situated at the eastern side of Mindanao. Combined population of Compostela Valley and Davao regions is estimated at 4 million people. The total land area is approximately 20,000 square meters with Davao Oriental having the largest area. Poverty incidence among families is quite high especially in Davao Oriental and Compostela Valley. These regions are also registered with the highest number of influenced barangays by the rebel groups. Given this, PAMANA will implement the reintegration program with the Department of Interior and Local Government (DILG) this 2012. Situated right at the heart of southern Philippines, Central Mindanao stretches up north to Bukidnon, Lanao del Norte, Lanao del Sur and down to General Santos City and Sarangani. Serving as a catch basin of the uplands of Bukidnon, Davao del Sur, North Cotabato and Maguindanao is Liguasan Marsh. The marsh registers a 5-meter ASL at the center, making it the lowest point in the region. The flat lands surrounding the marsh are fertile grounds good for growing crops and other agricultural products. The region, particularly North Cotabato is considered as Mindanao’s food basket providing rice, fruits and corn across Mindnao trade centers. The region also produces cereals, vegetables, sugarcane, coconut, coffee, freshwater fish and livestock. However, conflicts on land and natural resource use draw deep economic divide among communities. Given this, the PAMANA program is being implemented in the provinces of Maguindanao, and North and South Cotabato. The Provincial PAMANA Technical Working Group has identified that a harmonization of conflicting land use policy among NGAs is a key to address peace and development issues. ZamBaSulTa covers the island provinces of Zamboanga, Basilan, Sulu and Tawi-Tawi. In a study of the Department of Energy (DOE), the provision of electricity in barangays results to increase in security and economic opportunities in the area. Most island barangays in ZamBaSulTa, which have been affected by conflicts involving different conflict lines, remain isolated and without access to electricity. A map of these barangays will assist national government agencies (NGAs) in planning for sustainable power generation program in conflict-affected areas. Aside from bringing in electricity to isolated communities, PAMANA continues to develop roads and water systems in the ZamBaSulTa zone.